For a security doomed to decrease in value over time Barclays’ VXX does amazingly well. Its volume averages over 50 million shares per day and its assets under management have stayed around $800 million to $1.5 billion for the last couple of years. Not bad for a product that has averaged a 58% annual loss since its inception in January 2009. This works out to an average loss of almost 7% per month. See “Volatility Fund Monthly and Year Decay Rates” for a chart showing how these losses have varied over time. According to its prospectus, Barclays can reverse split VXX any time after it closes below $25 and that reverse splits will always be at a four to one ratio. 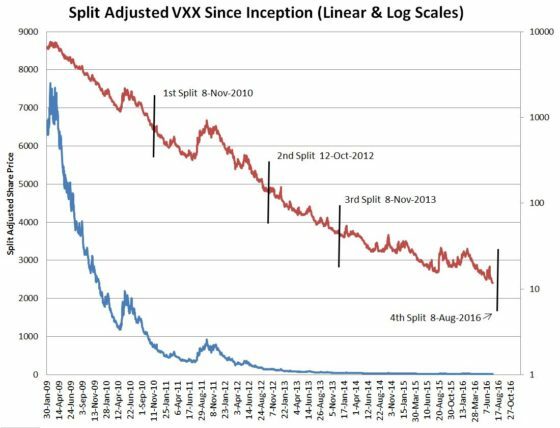 The first and second splits of VXX occurred after about 22 months, but 2012 did not have volatility bumps like 2010 and 2011, so the 3rd reverse split was only 13 months after the 2nd one. Volatility has kicked up quite a bit since 2014 so it took a record 34 months before Barclays reverse split this product again. The approximate decay per month slowed down to “only” around 3.5% per month (35% per year). In 2016 decay rates have returned to more historic norms—with decay rates in the 7% to 9% range. Since the 2016 reverse split a period of high contango and low volatility has eroded VXX back to reverse split range in a record low 12 months. 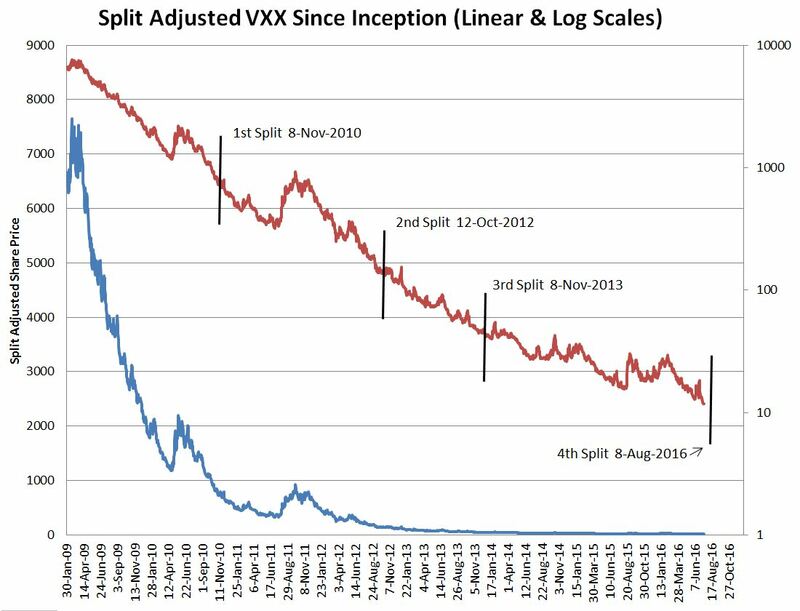 The chart below, with both log and linear scales, shows VXX’s sordid split-adjusted price history. Given its horrid track record, it’s fair to ask why people keep investing in VXX. Some are just trying to profit from volatility spikes, hoping to catch the next big crash that somebody is always predicting to happen soon. Others are trying to hedge their equity holdings with VXX because it is one of the few securities that reliably goes up when the market is panicking. Unfortunately, this strategy rarely works well. 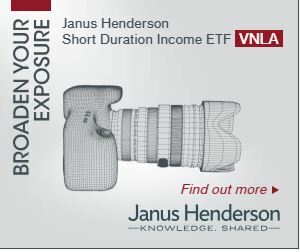 Unless your timing is very good owning enough VXX to effectively hedge your portfolio is prohibitively expensive. If you hold shares of VXX there isn’t anything to worry about when it reverse splits. The value of your investment stays the same through the reverse split process. You just have 4X fewer shares that are worth 4X more each (assuming a reverse split ratio of 4:1). If your shareholdings are not a multiple of four, say 215 shares, you will get 53 reverse adjusted shares and a cash payout for the 3 remaining pre-split shares. If you are short VXX, same story, no material impact. If you were holding VXX options (long or short) when the reverse split occurred there’s still no material impact, however, the option chains are going to hurt your head for a while. This Options Clearing Corporation memo describes the adjustments for the August 2017 reverse split. 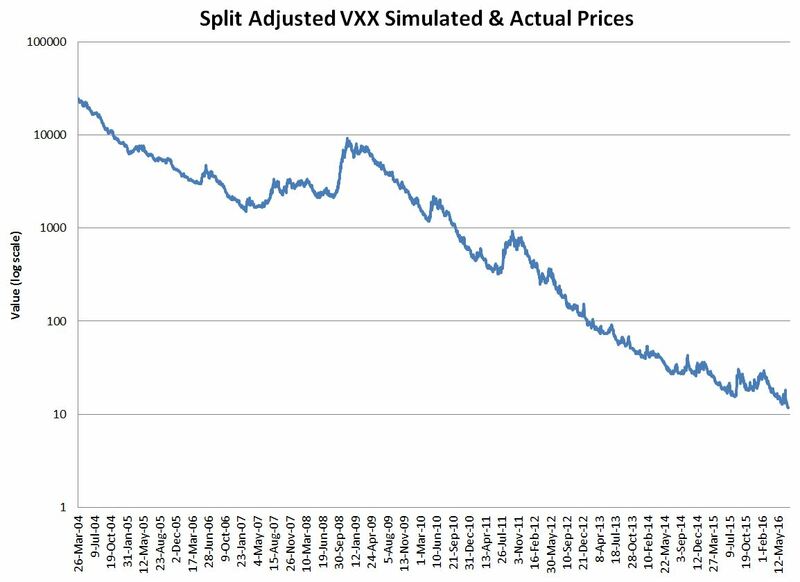 It adjusts the number of VXX shares per option on the pre-split contract from the usual 100 to 25. The option strikes are not adjusted and the underlying symbol that the options trade against is VXX2, a new symbol—which is set at 25% of VXX’s price. These contortions are required so that holders aren’t left with fractional contracts–something the options clearing house doesn’t want to deal with. So, as an example, let’s say you hold ten pre-split call options on VXX with an expiration date of September 15th and a strike price of $10. Each contract was worth around 2.81 ($281) at the close on August 21st (VXX’s closing price was 12.77) so your overall position value is around $2891. After the reverse split your contracts are adjusted so each contract has 25 shares of the new reverse split VXX as its deliverable. The strike price, $10 stays the same, and the effective price of the underlying that the option is priced against is the current VXX value divided by 4. So, if on August 24th, right after the reverse split VXX’s price is $51.08 and VXX2’s price is 12.77. Your options will continue to be worth about $281 each, and you still own 10 contracts so your position is still worth around $2891. The only difference is that if you exercise all your contracts you won’t get 1000 shares of VXX, you’ll get 250 shares. If you do exercise your shares the price you pay per share will be the reverse split value of the strike price, in case of the example above you would pay $40 per share (4*10) if you exercised. New options created after the split will be generated with VXX as the underlying, but the old adjusted options will hang around until they expire. I’ve seen reports that the liquidity on the adjusted options is not good, so if you are planning on exiting your options, rather than just letting them expire you should consider closing out your positions and re-establishing them after the split. For regular, forward splits things are more straightforward —the strike price of the options are divided by the split ratio, and the number of contracts is multiplied by the split ratio. See the OCC memo on SVXY’s 1:2 split for an example. This basic approach can’t be used on reverse splits (multiply the strike price and divide the number of contacts by the split ratio) because depending on the number of contracts held some customers would end up with fractional contracts—which is a no go.